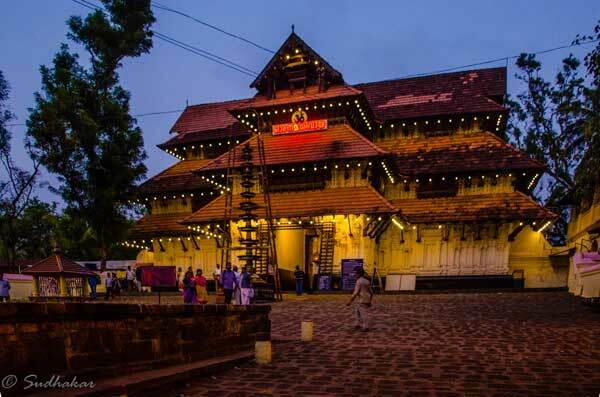 Vadakkunnathan Temple is situated in Thrissur, Kerala.The name Thrissur is from 'Thiru-Shiva-Peroor', which means "the city of the sacred Shiva". Thrissur was also known as Vrishabhadripuram and Thenkailasam or Dakshina Kailasam in ancient days. 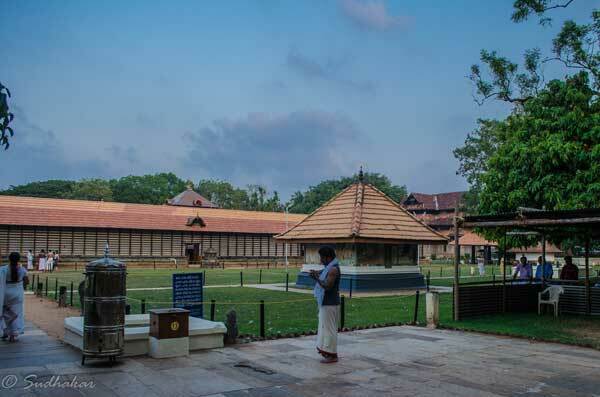 This temple is a classic example of the architectural style of Kerala situated in a sprawling area of several acres.This is said to be the first Shiva temple created by Lord Parasurama. Adi Sankara is believed to have been born to the Shivaguru and Aryamba of Kalady in answer to their prayers before Vadakkunnathan, as an avatar (incarnation) of the Lord shiva. 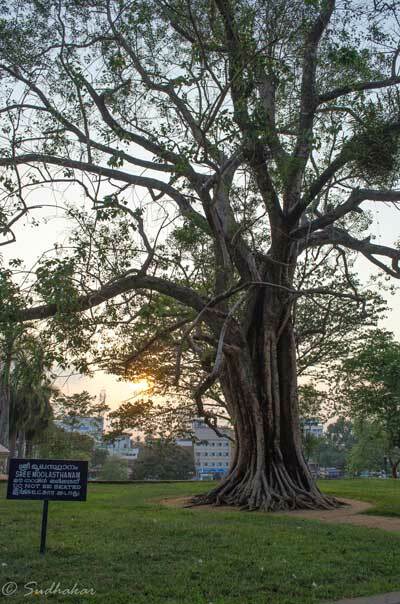 The place where Shiva first manifested as swayambu as a lingam is the Sri Moola Sthana at the foot of a huge banyan tree.For many years, the lingam remained at the foot of this banyan tree. In the later years,the ruler of Cochin then decided to shift the lingam to a more convenient place and enclose it in the present temple. The temple has four gopurams each facing the four cardinal directions. The gopurams on the south and north are not open to the public. The public can enter through the east or west gopuram. Between the inner temple and the outer walls, there is a spacious compound. The inner temple is separated from the outer temple by a broad circular granite wall enclosing a broad praharam (corridor) called Chuttambalam. Lord Shiva's idol in the main sanctum is a large lingam. It is always concealed under a mound of ghee,formed by the daily abhisheka with ghee over the years, and because of this the lingam is not easily visible. The ghee covered lingam is decorated with thirteen cascading crescents of gold and three serpent hoods on top.People believe that ghee has been presented to the Lord since many centuries and it has not gone bad or rancid and does not possess any bad smell. It is a wonder that even during the hot summer months , the ghee does not melt spite of the heat. In the outer temple, there are sannidhis for Krishna, Parasurama, Simhodara, Ayyappan , Vettekkaran (Shiva in the form of a hunter), Naga devathas(Serpent deities) and Adi Shankara. Outside the main temple, are the sannidhis of Lord Subrahmanya and Lord Ganapathi. Located on the verandah of the Nalambalam is the large white bull Nandikeswara. Theare sannidhis for Rama and Shankaranarayanan, the combined form of Shiva and Vishnu. The temple is famous for the rare and beautiful kerala murals, of which the Vasukishayana and Nrithanatha (Nataraja) are worshipped daily even today.A study by Archaeological Survey of India on these two paintings in the temple has revealed that it is more than 350 years old.The temple also houses a museum of ancient wall paintings, wood carvings and art pieces of ancient times. The temple auditorium called as Koothambalam, with four magnificent gopurams and the lofty wall around the temple have been skillfully crafted. The Koothambalam is used for staging Koothu, and Koodiyattam (ritualistic art forms of Kerala). Lord Ganesh sannithi is situated facing the temple kitchen and offering of Appam made of ghee to Mahaganapathy is one of the most important offerings at this temple. Praying to Ganapathy here is believed to bring prosperity and wealth. Rituals It is believed that you have to follow a certain order of worshippimg when moving between the sannadhis.It is advisable to ask somebody inside this temple for this. Maha Shivaratri is the main festival which is celebrated in the temple. Cultural and musical programmes are held in the temple premises. Around one lakh oil lamps (hundred thousand)are lighted in the festival. Aanayoottu The Aanayoottu is the second biggest festival held in the temple. Elephants being considered as the incarnation of Lord Ganesha, feeding of the elephants are considered sacred and called anayootu. The festival falls on the first day of the Malayala month of Karkidakam (Ashada or Aadi month) during July. It has been the regular annual practice at the temple for the last 20 years to conduct a large scale Ashta Dravya Maha Ganapathy yagna and the Aanayoottu. Many devotees throng the temple to feed the elephants. Gajapooja also is conducted once every four years. Thrissur Pooram festival One of the most colourful temple festivals of Kerala, Thrissur Pooram is conducted in the adjacent huge ground but the temple does not participate in this festival. This festival is celebrated by two rival groups representing the two divisions of Thrissur Paramekkavu Bhagavathi temple and Thiruvambadi Sri Krishna temple trying to showcase the display of fireworks and display of elephants. Each group parades elephants with artistic decorations. This festival commences in the early hours of the morning, the and last till the break of dawn, the next day. Where to Stay? There are many decent hotels at various budgets in the city.During the pooram festival, it will be difficult to get accomodation unless you book well in advance. Places nearby You can visit the Paramekkavu Bhagavathi temple and Thiruvambadi Sri Krishna temple are in close proximity to Vadakkunathan temple.